WHAT ARE THE BENEFITS FROM USING NATURAL EVOLUTION PRODUCTS? This amazing flour can replace any plain flour or self-raising flour. Simply use your favorite recipe and replace the flour you would normally use with Mt Uncle’s Banana Flour. When needing a rise simply add 1 teaspoon bi-carb soda to one cup of Mt. Uncle’s banana flour to make self-raising flour. 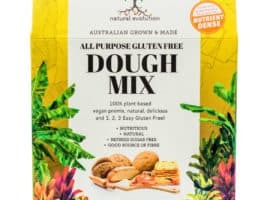 This product is very high in dietary fibre and is milled from our incredible tasting bananas grown on the Atherton Tablelands.